Disasters come often. More often lately it seems. 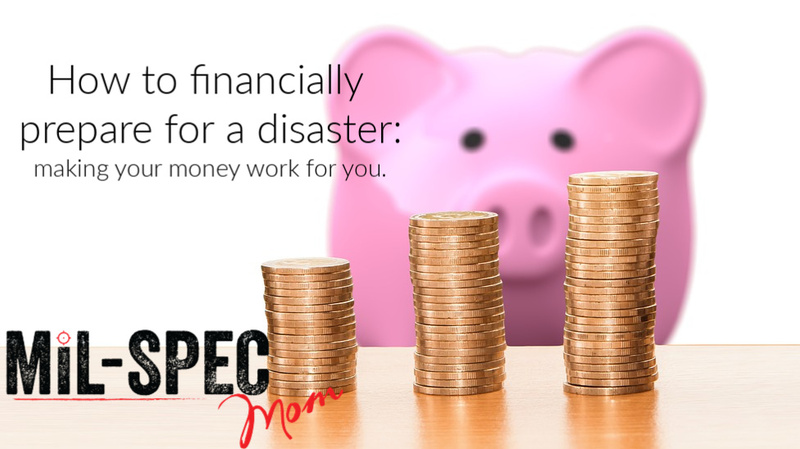 While Pinterest is rife with all sorts of mitigation measures, which I’ll be covering in depth soon, there’s not much emphasis on financially preparing for a disaster. That’s what we are going to cover in this post. If you’ve been following me for a while you know that I love Dave Ramsey. He has a tried and true method for gaining financial independence. We can use his methods to gain disaster independence also. Save 3 to 6 months’ worth of Expenses for emergencies (like job lay off etc). Save for your children’s college. Start a mutual fund so if your kids don’t go to college you/they can use those funds for another purpose! Pay off your home early! Using that debt snowball that you have left after all your consumer debt is paid, your contributing to your retirement, and to your kids’ education, use what’s left to pay off your mortgage early. So now that we have a baseline for some financial goals, here is where the disaster preparedness comes in. DR is all about sinking funds. A sinking fund is a fund, account, or envelope that you put the monthly amount of an annual bill into. For example, Car tags. If you pay $600 for car tags each year you should be putting away $50 into your fund, account, or envelope each month as part of your budget. (600/12=50). We have a line item for preparedness that we use each month to purchase or outfit our family for a disaster. We save the money and store it in an envelope if we are trying to save up for a larger purpose also. Here are some other tips to financially prepare for a disaster. Have cash on hand. $1000 is a nice round number in case the power is out, and you need to purchase supplies. Keep a disaster fund. Always save for a rainy day. Ensure you have the proper insurance coverage. Home owner’s insurance, flood insurance, earthquake insurance, and personal property insurance are all great plans to have even if the risk isn’t 100%. Keep a well-written record of the high-value items in your home. You can keep a notebook, word document, or better yet, take a photo of each room to showcase the items and keep it on a thumb drive in a strong box. Take advantage of direct deposit and automatic bill pay. At least money will be coming into and out of your accounts as it should. Have AT LEAST your insurance deductible set aside in a separate account for emergencies. It’s a good rule of thumb to go by. If your insurance deductible is $5000 for disaster, have at least that much in a separate account or earmarked. Know what your insurance policies cover. Call and talk to your insurance rep about what is covered, what isn’t, where the loopholes are, and how long it can take to get funding. Spam me with your favorite financial disaster preps!